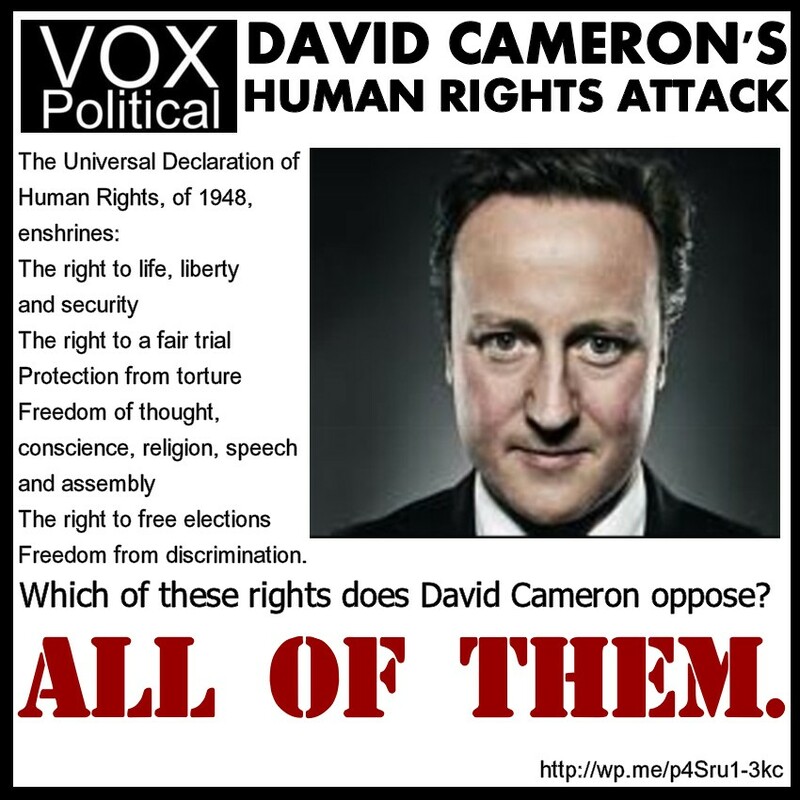 It will soon be farewell to your hard-won human rights, if David Cameron follows through on his plan to ditch the Human Rights Act in favour of a ‘Bill of Rights’ forbidding you any liberties that don’t benefit Tory donors and fatcat bosses. David Cameron has attacked Labour’s Human Rights Act, saying that it has “distorted and devalued” the good name of human rights, and it is up to his “generation” to restore their reputation – but we know that David Cameron speaks with a forked tongue. This is the man who said he would not raise VAT – and then raised VAT. This is the man who said the vulnerable would be safe under his government – and a petition to establish how many have died under his government’s policies currently stands at 120,000 signatures after nearly two weeks. This is the man who said the National Health Service was safe in his hands – and has been selling it off piecemeal since 2012. You should never trust this man. Note that he raised the question of human rights during a speech to mark the 800th anniversary of the signing of the Magna Carta – an event that is often seen as the beginning of the journey that allowed every UK citizen the freedoms they enjoyed… until Margaret Thatcher started restricting them again in 1979. In fact, the so-called ‘Great Charter’ promised the protection of church rights, protection for the barons from illegal imprisonment, access to swift justice, and limitations on feudal payments to the Crown, to be implemented through a council of 25 barons. The Magna Carta did nothing to free ordinary people from the yoke of feudal lordship – it was all about rights for the Church and the Barons – the fatcat bosses of the time. So it is no wonder that Cameron, whose premiership has consisted almost entirely of appeasing fatcat bosses in order to encourage them to donate money to his party, quotes Magna Carta when he talks about taking away your rights. He knows you’ll think he’s talking about giving normal people more rights, when he’s really taking them away and helping his friends. You see? David Cameron speaks with a forked tongue. When it comes to anybody who doesn’t own a major corporation or a lordly title, he’s against all of them. Did you realise that Cameron would be taking away all of your rights, forever? exactly the same as Labour’s Human Rights Act,of 1948. think its time cameron etc actually READ the Magna Carta. weve had these same rights since King John signed the thing. he obviously hasn’t read it. all labour did was take the same ideals and enshrine again in law. in other words reiterated what was in the MC and committed it to paper again. i realise i cannot reproduce those pics on here but if anyone would like to see those photos. just find me on Facebook and ask. i will gladly send them to people. That’s interesting, because the protection of individual freedoms is not what the original document was about at all! The original 1215 charter concerned the medieval relationship between the monarch and the barons, rather than the rights of ordinary people. The Labour Human Rights Act was in 1998 and not in 1948. The 1948 date is for the United Nations Human Rights. exactly the same as Labour’s Human Rights Act,of 1948. Oh, I beg your pardon. Obviously she was confused and so was I. I thought she had referred to the 1948 declaration mentioned in the infographic – shows what happens to your memory when you’re very busy. Glad that’s all cleared up; even though it doesn’t make much material difference, as the HRA merely enshrines in UK law the 1948 declaration, it’s good to have everything properly labelled. The Nasty Party have never ever wanted ordinary people to have any rights whatever. They are now determined to set the clock back to the 19th century. Can’t wait for 2020, by that time ordinary people will realise what they have lost and get rid of this rotten shower led by Cameroon. There will be no change,it can’t get through the commons….there is only a small group of nazis who want it dumped….all Tories of course! very interesting Mike. i am not doubting you but why would they put those things up on the wall like that if thats not what was in the original? i couldn’t read the actual document that was under glass. written in old English and old English letters made it difficult for starters. plus i cant see to read very well even with my reading specs on in a dark room like that was.the document which i think was under some type of light but still not easy to read.there is more to what is said on those wall notes but far too much for me to type it all out. if you wish to see them for yourself,(and you may understand them better than i do) then either find me on fb and look in my photo albums for march 2013 and Lincoln castle. or ask for the photos. I can’t tell you for sure, but my best guess would be that whoever created the exhibit wanted to show how the rights we currently enjoy started with the Magna Carta (even though it actually helped the Barons and the Church – not the working people). Don’t for god’s sake become disabled. I have 3 of the 4 so I’m on Obergruppenfuhrer IDS’s hit list with the full approval of his lord and master. If those who voted Tory should suffer one of more of these afflictions within the next five years you will surely learn what a caring sharing lot the Tories truly are, and when you look to me for advice I’ll simply say “told you so” and turn my back which is the Tory way. b) restrict the right to dissent with their policies. This is not democracy or progress, it`s indentured servitude by increasing hardship & therefore encouraging reliance on credit, as your average working man/woman will remain docile/compliant in order to tread water financially…for fear of becoming destitute or homeless. Austerity Is Necessary, We`re All In It Together (plus Making Work Pay) will be remembered by this generation as the biggest bare-faced political lies of the 21st Century – & that`s after only 5 years of Cons govt. :I shudder to think what`s ahead unless you have a million+ in the bank at this point in your life…& let`s face it, the economic policies are not going to increase THAT statistic/percentage of the UK population. Welcome to 21st century feudalism. You’ve got exactly the right idea. Tory policies are all about helping Tory donors and stopping anyone from complaining about it.